Where is Grayton Beach State Park? This beautiful park is located on Santa Rosa Island in NE Florida on the Panhandle. It is one of the most popular beaches in all of Florida and has often been referred to as the Nation’s number one beach. 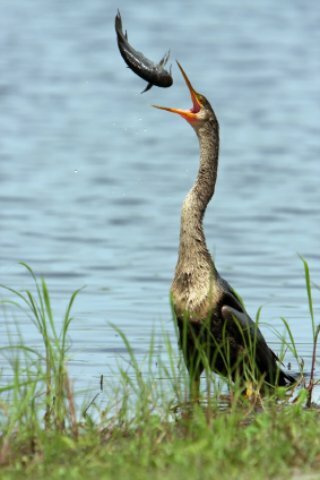 Anhinga Bird caught fish sideways and flips it to go down its throat. From its spectacular vantage point in the heart of Santa Rosa Island, it offers over 3 miles of pure beach bliss with rolling sand dunes and an abundance of exotic birds and wildlife. And what's more, a relaxing getaway full of fun things to do for the whole family. There are several coastal forests for nature lovers to explore and the sunrises and sunsets are said to be some of the most beautiful ever seen. You can stay right on the beach at Grayton Beach State Park in one of the cabins in wooded areas with spectacular views of the water. This great beach is indescribable in words and must be seen to believe. Don't miss Destin Beach Florida, so close and so much to do. What to do: Enjoy the many activities right on the beach, or travel a little further into the Beaches of South Walton to partake in golf, tennis or water sports such as snorkeling. If you enjoy antiquing, check out The Wesley Mansion, which is filled with antiques and historical artifacts. Take a walking tour through Grayton beach or one of the nearby beaches. Take the kids to try YOLO boarding, where you can learn to paddle board standing up! Where should I eat? Santa Rosa Beach, where Grayton Beach is located offers various restaurant choices. If you have children, check out Stinky’s Fish Camp, which offers great seafood and family meal options. If you’re in the mood for some authentic Italian Food, try Enzo’s Italian Restaurant for some great Italian cuisine. Picolo of Grayton Beach (also known as Red Bar) has “the best” crab cake specials and offers a fun, light atmosphere. Where should I stay? One of the campsites right at Grayton is a wonderful choice if you’re looking to stay right in the center of it all. If you prefer a hotel, there are not a lot located right at the town of Grayton but there are numerous choices a little farther down the beach at one of the other South Walton beaches.